I cram a lot of activities into my trips. See Vacation Exhibit A. I’m working on slowing it down. A visit to an art gallery actually does the trick nicely when on vacation. Our visit to Morean Arts Center was a breath of fresh air when we were in the Tampa Bay area recently. It’s located in downtown St. Petersburg, Fla. If I could pick one word to describe it, I’d say it was calming. If we went with two words, it’d be calming and fun. 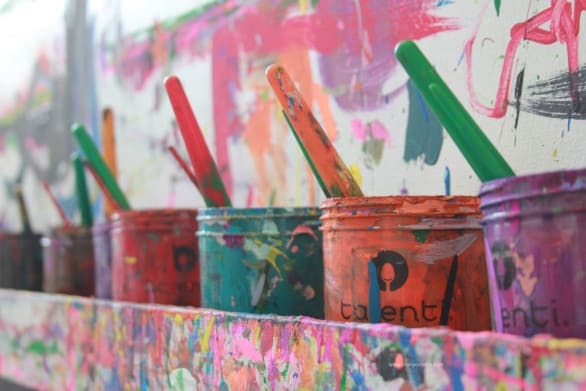 Kids can explore different art tables for free every Saturday at Morean Arts Center in downtown St. Petersburg. 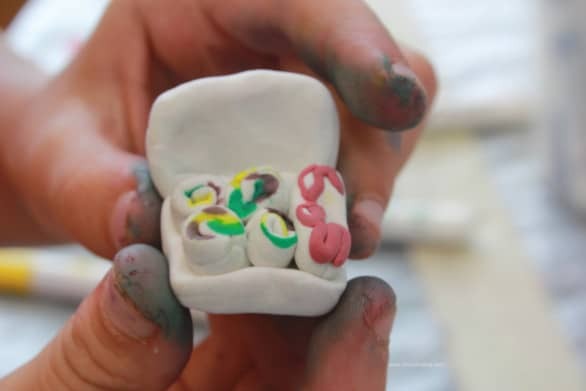 This clay sushi was made by a little girl who was at the arts center at the same time was us. We timed our visit to take advantage of the FREE kid-friendly art experience held every Saturday. 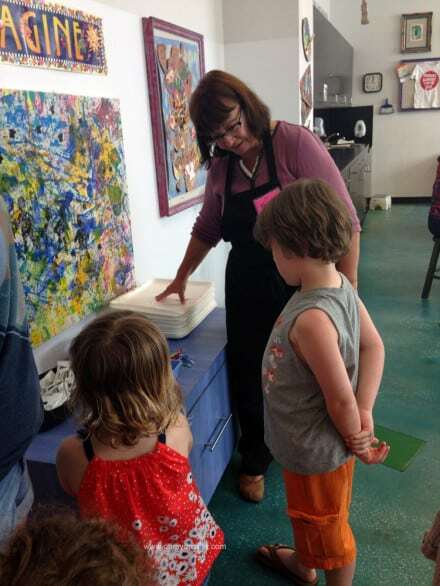 While Visit St. Petersburg/Clearwater gave my family and friends free passes to explore all of their amazing venues – Morean Galleries, Glass Studio and Hot Shop, Morean Arts Center for Clay, and the Chihuly Collection – the kids would’ve been as pleased as punch if we stayed in the education studio the entire day. 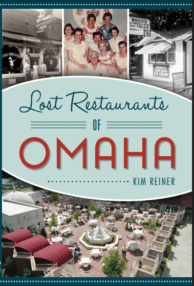 For the Omaha crowd, it’s kind of a cross between our own Hot Shops and the arts center at the Omaha Children’s Museum. 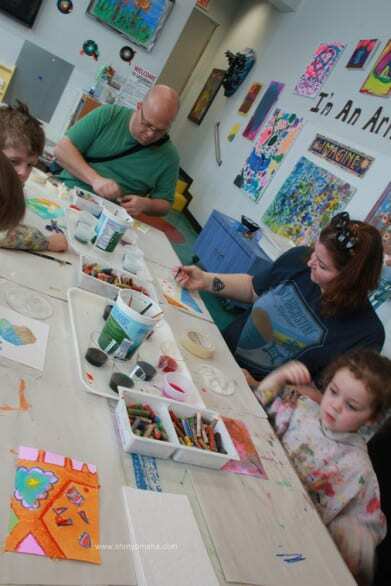 The free art experience is on Saturdays from 10 a.m. to 4 p.m. (with a lunch break for the instructor tucked in there). Everything in the kids studio at the Morean Arts Center was at their height and in their size. It’s best for ages 5-10, but the two 3-year-olds in our crowd had as much fun as their big brothers. There is an instructor on hand to help explain any o the art stations. The kids check out a table with sculpting clay. Anyway, the kids enjoyed the quiet time at various stations, and even the three of us adults in our group joined in. Parents might as well join in the art making, right? We had to leave the studio for the instructor’s lunch time, so we made our way into the various galleries at Morean. Mooch had the kids’ camera, making our meander a snail pace. The girl takes after her Grampy, taking pictures of pictures. 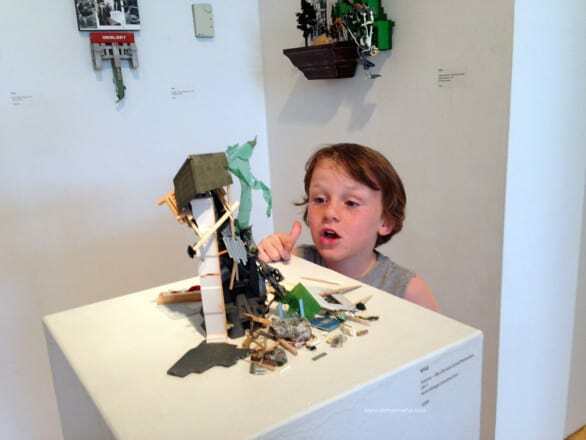 One of the galleries at Morean Arts Center features artwork by students, which appealed to our younger art critics. 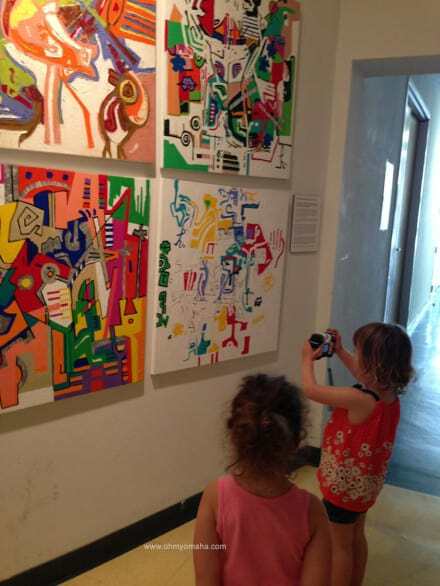 There are temporary exhibits at Morean, and during our visit, the kids found one they loved. What’s not to love about artwork that sneaks in ninja turtles or Darth Vader? 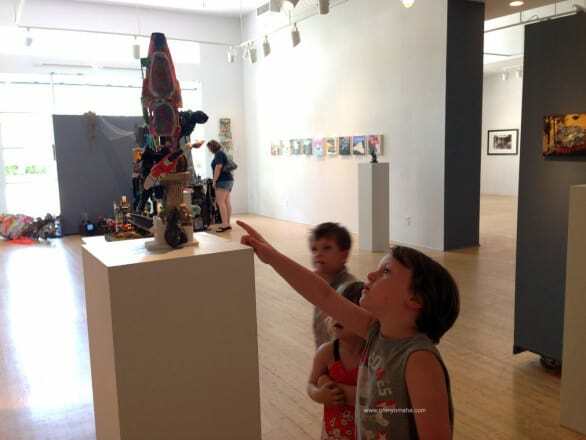 The boys were particularly fascinated with one exhibit at Morean Arts Center. I think it might have had something to do with the recognizable figurines included. 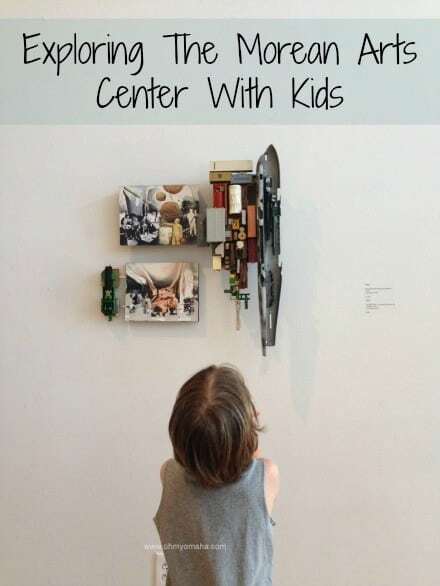 There’s no guarantee you’ll find a similar exhibit like this one if you go, but the beauty of art is that there’s always a way to strike up a conversation about it with kids, even if it’s simply asking them to pick out their favorite and asking why. My friend’s son really liked the Morean Arts Center. I forsee hot-glued action figure found art in his future. 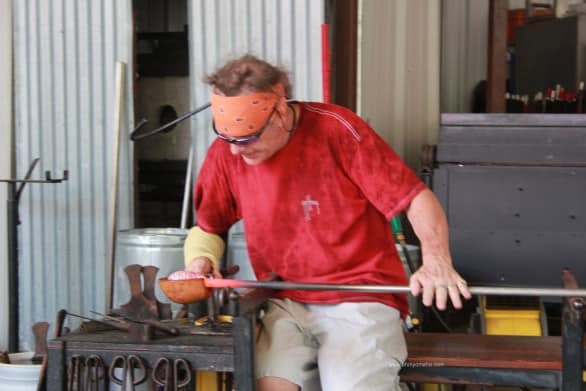 Our next stop was next door: The Morean Glass Studio and Hot Shop. This was a memorable stop! We watched resident artist Pauli Nelson Maiville create a serving bowl during a live demonstration. We arrived in time to watch a live glass blowing demonstration. If you’ve never seen one, these are pretty cool to watch. I’m not sure who was more impressed with the process – me or the kids. The kids eventually scooted up closer to the front of the bleachers to get a better view of the glass blowing. 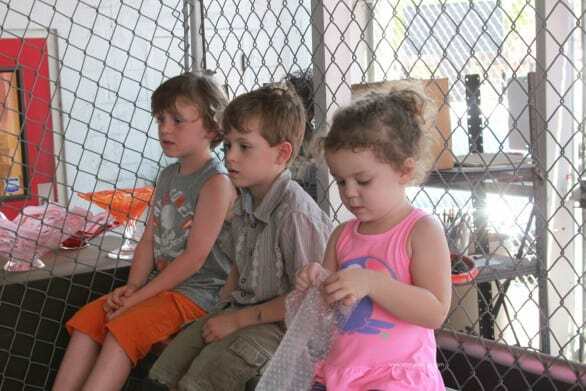 Yeah, bubble wrap does trump glass blowing with preschoolers. One person explained what was happening as we watched. The resident glass artist, Pauli Nelson Maiville, made it look so easy – but the end result was incredibly beautiful. 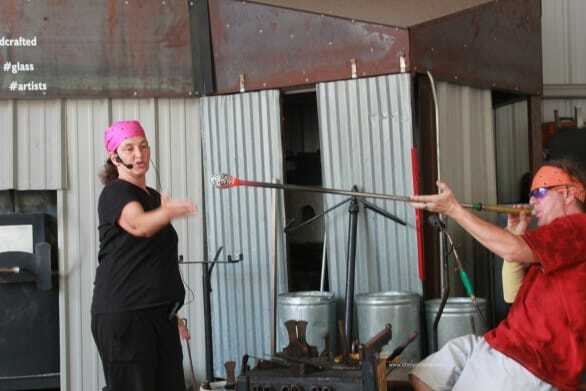 The glass blowing process was explained to the audience. I wish we had gotten one of the finished pieces! However, Mr. Wonderful and Mooch had secretly left our group long enough to pick out a glass necklace for me, and patiently waited to give it to me until Mother’s Day. If you purchase tickets to the St. Petersburg Art Experience, you’re able to visit Morean Arts Center Galleries and the Glass Studio & Hot Shop, as well as the Chihuly Collection and the Morean Arts Center for Clay. If you had older children, you could easily make the four spread out stops in a day. We were with four kids who were 5 and under, and two stops were our max. 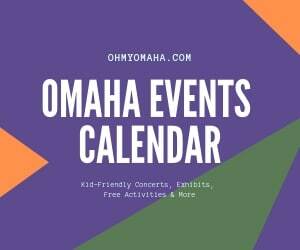 Morean Gallery, Monday through Saturday, 10 a.m. to 5 p.m. (children’s art experience is Saturday, 10 a.m. to 4 p.m.); Sundays, noon to 5 p.m.
Chihuly Collection, Monday through Saturday, 10 a.m. to 5 p.m.; Sunday, noon to 5 p.m.
Glass Studio & Hot Shop, daily noon to 5 p.m.; daily demonstrations are at 1, 2, 3 and 4 p.m.
Disclaimer: My family and friends were provided complimentary St. Petersburg Art Experience tickets courtesy of Visit St. Petersburg/Clearwater so that I could review our experience. All opinions and thoughts were my own. That looks like a fun place! My husband packs our trips with things to do as well. 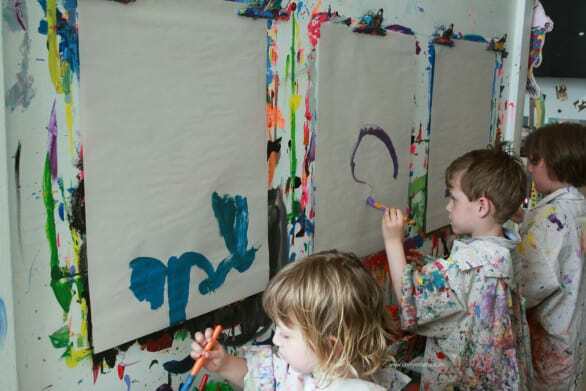 The Morean is definitely your kind of place, just basing it on your family’s arts background and how creative your boys are.